This ancient green vegetable has been making its way into many of our dishes lately and giving the kind of energy you won’t get from a vitamin pill. Added into Enchiladas with mushrooms and a bunch of asparagus and you have a energy boost without the heaviness of meat – great for ‘meat free’ days when you still have a lot of running around to do tomorrow, or place in a lasagnes and other pastas, as long as we don’t boil it to a pulp, you can digest one of the highest Vitamin A, Vitamin C and bone strengthening Vitamin K content vegetables available – perfect for this time of year when the sun is ultra clear. We simply wash it well and braise it, or add it in to dishes as described above – no boiling required! The curly kale (or Scots-kale; Blue Curled Kale) is the variety we use, and available at around two dollars a bunch at present so, we offer a few recipes so you too can get that extra Spring Zing! Remove the leaves from the kale. Tear the leaves away from the stems and center ribs. Chop them coarsely and place them in a bowl. Chop the stems and center ribs of the kale. Cut them into 2-3 inch (5-7.6 cm) pieces. Melt 2 tbsp. butter and 2 tbsp. olive oil in a large skillet. Melt them over medium-high heat and wait for the butter to melt completely. Stir in 1 tbsp. minced garlic and 1/2 diced small red onion. Cook them together for at least 20 seconds, until the mixture is fragrant. Add the kale stems and 1/2 cup dry white wine to the mixture. Simmer the stems for 5 minutes or until they begin to soften. Stir in the leaves. Cook the kale until the leaves are wilted, at least another 3 minutes. Turn off the heat and place the kale into a bowl. Stir in 1 tbsp. fresh lemon juice and 2 tbsp grated Parmesan cheese. Mix the kale until you've distributed the lemon juice and Parmesan cheese. Season to taste with salt. Place the kale on a serving dish and enjoy it as a side dish. Stem and cut portobello mushrooms. Cut the portobello mushrooms from one 8 oz. package into pieces that are 1/2 to 2 inches (1.2 to 5 cm) long. Trim and chop the Swiss kale. You don't have to chop it into perfectly-sized pieces -- just cut it enough so the kale can fit into the pan, with leaves that are no more than 5 inches (12 cm) long. Heat 2 tbsp. olive oil in a large pot over medium-high heat. Stir 1 tsp. crushed red pepper and 1 clove crushed garlic into the oil. Stir the mushrooms into the mixture. Stir the mushrooms until they have softened and have begun to release their liquid. This should take 3-5 minutes. Stir 1 chopped leek into the mixture. Cook for 5 more minutes, until the leek has softened. Stir in 1 cup vegetable broth and kale. Cover the mixture and simmer it until the kale leaves wilted. This should take about 10 minutes. Remove the lid. Keep cooking the kale until it's tender and most of the liquid has evaporated. Make sure not to burn the kale if the liquid has evaporated too early. This should take about five minutes. Sprinkle the kale with 2 cups grated Parmesan cheese. Let the kale stand until the cheese is melted. Serve the kale as a side dish, or even as a main course. You can top some quinoa or whole wheat pasta with the kale for a delicious meal. Or serve with brown rice. Yum! Remove the center ribs and stems from the kale. Cut the leaves into 2" (5 cm) pieces. Bring 1/2 cup dry Sherry and 1/2 cup raisins to a simmer in a small saucepan. Remove from the heat. Let the mixture cool. Heat 2 tbsp olive oil in a large pot over medium-high heat. Stir in 1/2 cup sliced almonds. Let the almonds cook until they begin to brown, stirring frequently. This should take about 2 minutes. Add 4 thinly-sliced garlic cloves garlic. Cook for a minute, until the garlic is fragrant but not browned. This should take about 1 minute. Add kale to the pot. Add the kale in handfuls, tossing them to wilt them to make room for the next handful of kale. Cook until the kale is tender, which should take about 4 minutes. Pour the raisin and sherry mixture over the kale. Add 1 tbsp. grated lemon zest, 2 tsp. lemon juice, and 1 thinly-sliced red jalapeño to the mixture. Season with salt and pepper to taste. Toss the kale to combine all of the flavors. Serve this sweet and spicy kale as a side dish. Kale or boerenkool is a vegetable of the plant species Brassica oleracea. It has green or purple leaves, in which the central leaves do not form a head. It is considered to be closer to wild cabbage than most domesticated forms of vegetables. 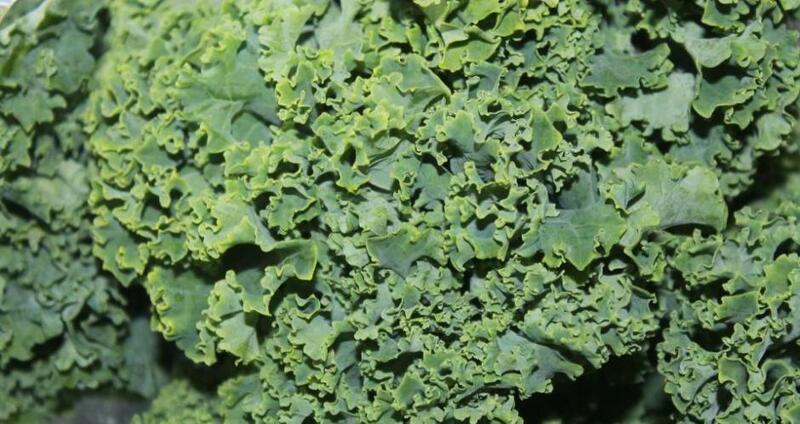 The name borecole originates from the Dutch boerenkool (farmer's cabbage), whereas kale bears semblance to the Danish, Swedish and Norwegian kål and to the German Kohl (a general term for various kinds of cabbage) and Scottish Gaelic càl (or kail, as in Kilmany Kail; a rabbit, salt pork and kail broth from Kilmany in Perth, Scotland). Some varieties can reach a height of six or seven feet; others are compact and symmetrical and of good quality for eating. Many, however, are coarse and indigestible. Most kale are either annuals or biennials, and are raised from seeds, which, in size, form, and color, resemble those of the cabbage. Until the end of the Middle Ages, kale was one of the most common green vegetables in Europe. Curly-leaved varieties of cabbage already existed along with flat-leaved varieties in Greece in the fourth century BC. These forms, which were referred to by the Romans as Sabellian kale, are considered to be the ancestors of modern kales. Today one may differentiate between varieties according to the low, intermediate, or high length of the stem, with varying leaf types. The leaf colours range from light green through green, dark green and violet-green to violet-brown. Russian kale was introduced into Canada (and then into the U.S.) by Russian traders in the 19th century. In a 100 gram serving, raw kale provides 49 calories and is a rich source (> 19% of the Daily Value, DV) of vitamin A, vitamin C, vitamin K, vitamin B6, folate and manganese (table, raw kale). Kale is a good source of thiamin, riboflavin, pantothenic acid, vitamin E and several dietary minerals, including iron, calcium, potassium and phosphorus (table, raw kale). Boiling raw kale diminishes these nutrient contents, with the exception of vitamin K (table, boiled kale). The Kailyard school of Scottish writers, which included J. M. Barrie (creator of Peter Pan), consisted of authors who wrote about traditional rural Scottish life (kailyard = kale field). In Cuthbertson's book Autumn in Kyle and the charm of Cunninghame, he states that Kilmaurs in East Ayrshire, was famous for its kale which was an important foodstuff. A story is told in which a neighbouring village offered to pay a generous price for some kale seeds, an offer too good to turn down. The locals agreed; however a gentle roasting on a shovel over a coal fire ensured that the seeds never germinated.